"Let me have the best solution worked out. Don't argue the matter. The difficulties will argue for themselves." The names of "E.C.R. Lorac" and "Carol Carnac" were pseudonyms belonging to the same novelist, Edith Caroline Rivitt, whose bibliography is an impressive résumé of a prolific mystery writer who had no problem churning out three or four books a year, but that apparently came at a cost. If you go to Lorac's GADWiki page, there's a positive comment from the lauded reviewer of the Observer, "Torquamada," praising her pleasant style, ingenuity and sound characterization, which ran contrary to Nick Fuller's experience with Lorac that he described as pedestrian or humdrum books. 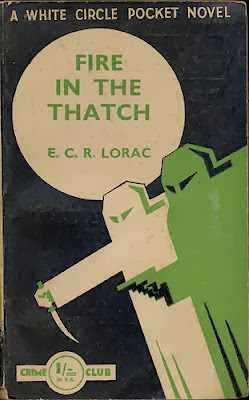 My only brush with Lorac was Murder by Matchlight (1945), which I read years ago, but the only fragments from that story still clinging to my memory are the atmospheric bits and pieces about London during the blitz of the Second World War. Those dark days when ARP wardens and the wreckages of bombed houses dominated the streetscape, however, I couldn't tell you a single detail about the plot and that's usually not a good sign. The old Devonshire Colonel Roderick St. Cyres has a small cottage on his hands, Little Thatch, laying in neglect after the previous tenants quietly passed away and St. Cyres wants to let the place to someone who can restore the place and its garden to its former glory – except if it's a city dweller who wants to turn the house in a weekend playground. Naturally, the colonel turns down his daughter-in-law, June, who asks on behalf of Tommy Gressingham if he could take the place off his hands. The son of the St. Cyres' and June's husband is still a Prisoner-of-War, and poor June feels like she's wasting away in the countryside and wants to bring some of her friends over for a permanent play date. St. Cyres had already received a letter of recommendation on behalf of an invalid Navy officer, Nicholas Vaughan, from a Commander Wilton and Vaughan is the one who takes possession of Little Thatch before Gressingham even gets a glimpse of it. Vaughan is a bulk of a man sporting an eye-patch, seeking a quiet life in the country and works hard at restoring the thatched house with its garden, orchards and surrounding pastures. St. Cyres knows he's preparing a home for a woman and while his tenant keeps to himself, Vaughan's blends into the community and they're genuinely upset when he dies in an all-consuming inferno. The local authority is convinced Vaughan was the victim of an unfortunate accident (faulty wiring), but Commander Wilton is convinced there's more to the case than meets the eye and asks Scotland Yard to look into the case – and they send down Chief Inspector MacDonald. MacDonald is a bland, unassuming character with a sharp mind for facts and spotting a Shakespeare quotation when one is chucked at him, but he's just there to point at the murderer when the time came to wrap up the plot. And that wasn't a smooth job either. MacDonald himself admits that the explanation "sounds complicated in the telling, but the whole performance was possible." It wasn't so much that the solution was bad as it was unconvincing and struck me as a poor-man's John Rhode. All in all, not a bad read or mystery, but there are definitely problems when the background theme of a nation picking itself up after a devastating war is more interesting than the plot itself, but the fact is that I will probably remember Fire in the Thatch only for its post-WWII content, which forces me to agree with "Torquamada" on one point: the progression from war (Murder by Matchlight) to peace (Fire in the Thatch) is a nice, stylistic cohesive in a series that would otherwise only be bounded together by the presence of Chief Inspector MacDonald. "Violence does, in truth, recoil upon the violent, and the schemer falls into the pit which he digs for another." 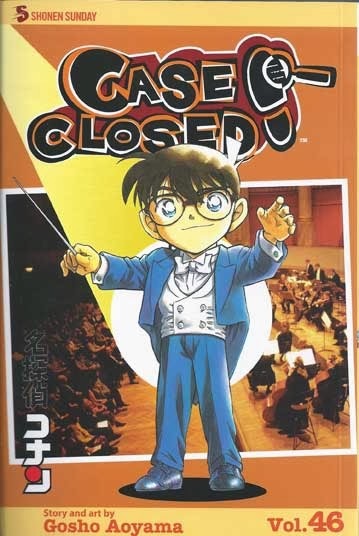 I've been lagging behind on my reading lately and Case Closed/Detective Conan is a series in particular that has been behind on reading schedule, but their short, episodic stories, embroidered on an ever-expending canvas of the overarching plot, makes them excellent material to pick up the rhythm of my reading pace – and musical rhythm is the theme of the 46th volume. Hasuki Shitara, who'll be playing on a valuable Stradivarius for her grandfather, Choichiro, at his birthday, summons Richard Moore to the ancestral home of the Shitara clan. The problem is that the violin has a history of violence that has recently added a death-curse to the Shitara family legacy, in which everyone who plays the Stradivarius on Choichiro's birthday dies. Two years previously, Hasuki's great-uncle's wife, Emi, fatally stumbled down a flight of stairs and last year it was her father who fell over the railing of a balcony – giving Moore precious little time to clear up a pair of suspicious deaths in order to prevent a third. Luckily, for Moore's reputation, Conan is tagging along in familiar fashion, but even he can't prevent the murderer from striking again: widowed-husband of Eli, Genzaburo, perishes in the flames and smoke of a fire started by someone in the annex of the house. Genzaburo's room was securely locked from the inside and clues in the room suggest that he started the fire himself by smoking in bed, but Conan smells a rat! The solution to this locked room mystery is fairly run-of-the-mill, however, Aoyama redeems himself when another member of the family falls from an open window – while everyone was listening to Requiem in D Minor in honor of Genzaburo. The room was, again, locked from the inside and there was a chair in front of the open window. So what else could it be but suicide? You could accuse Aoyama of being one-dimensional with his solutions to nearly every impossible situation he comes up with, basically variations of the same method, however, he mines at an incredible depth inside that narrow strip to find new applications for it. That's perhaps the most amazing part about his locked rooms. I would rank this (as a locked room mystery) somewhere between Paul Halter's Le diable de Dartmoor (The Demon of Dartmoor, 1993) and Cornell Woolrich's "The Room With Something Wrong," collected in Death Locked In (1994). Overall, this first of two big stories making up this volume was well done and enjoyed the subtle rib poking at the classic, British country-house-style mysteries. The butler, for example, is a starched, librarian-like woman, who runs the Shitara household with the efficiency of a small-country dictator and the ending winks at something that was more strongly condemned in previous volumes, i.e. allowing the killer to commit suicide. Conan's personal believe is that a detective who uses his deductive reasoning to corner a suspect and then does nothing to prevent the suspect from committing suicide, is in the end no better than the murderer himself. To be honest, I didn't expect too much from the second story, but it ended up being better than I expected and was exactly the kind of story I was in the mood for. Professor Agasa has to chaperon, once again, Conan and the kids from the Detective Boys' Club on one of their many trips and, as to be expected, they stumble upon trouble. One of the boys found a box-like stone with a hole and writing carved in it, in a pond located nearby a derelict warehouse from the Edo period – which belonged to a famous doll-maker from that period and possibly the location of a famous treasure. However, beneath the rubble in the pond they also find the body of a man and, while Asaga runs-off to call the police, they decide to enter the premise on their own. The place is littered with booby traps and along the way, they encounter other treasure hunters snooping around for bounty and over them looms the shadow of Conan's old adversary, the famous phantom thief, Kaito KID, who's after the treasure himself. This all amounts to what is basically a successful emulation of one of Maurice Leblanc's Lupin-in-disguise stories and showing the fundamental difference between the figures of the Great Thief ("What's the thrill of knowing what's in the box before you open it?") and the Master Detective ("Dumb guy. It's a detective's job to figure out what's inside before opening”). In between the stories, Conan has finally found a solid lead that goes straight up to the head of the organization that has put him in his current predicament and has been tailing for at least two-and-half-years by the series time-line. This volume is also book-ended with the concluding chapter of a story that was started in the previous volume, in which a dead stargazer left a dying message and concluded with the first chapter of a new story for the next volume. A regular review will be up ASAP. That... or I'll find some excuse to talk endlessly about locked room mysteries... again. "To see what isn't true is easy. But to see what is true will take some doing." The now-late H.R.F. Keating emerged as a mystery writer at the tail end of the Golden era, publishing his first novel in 1959, but didn't made his name until five years later with the creation of a downtrodden, Bombay policeman, Ganesh Ghote, whose trials as an underdog made him a fan favorite. In those intervening years, Keating accumulated experience as a novelist by cutting his teeth on a handful of standalone detective/thrillers and his second foray, Zen There Was Murder (1960), impressed me as a farewell to a previous, by-gone era. The setting is an old-fashioned, English country mansion converted into a school for adult educational courses (e.g. philosophy) conveniently occupied with a closed circle of suspects and a Japanese artifact that ends up being swiped from the premise – presented to the reader in the guise of a locked room mystery. However, don't expect too much from its explanation, because that's the only part of the solution in which contemporary attitudes rears it ugly head. Mr. Utamaro has the task of lecturing a small, but argumental, assembly on Zen Buddhism. There's a visiting schoolmaster, Alasdair Stuart, and a clergyman in limbo, Rev. Cyprian Applecheek, alongside the misses Flaveen Mills and Olive Rohan, but Honor Brentt is there hunting material for her weekly column in The World with her husband, Gerry, in tow – in order to help him abstain from women. Zen is discussed for the first couple of chapters, when the first disturbance happens: a Japanese small-sword, wakizashi, vanishes from underneath its glass showcasing that was hotwired to a burglar-alarm. They had to install an alarm system after the media picked up on a story attached to its bigger brother, the katana, now residing in an American police museum and confused the swords. However, the age of the small-sword gives it a bloody history of its own, because it was the blade used for hara-kiri. As I said above, you shouldn’t expect too much from the theft of the sword and stands out in the story as a small piece of anti-detective material in what’s otherwise a respectful send-up of the genre. The group decides to keep the police out of the affair and conduct their own sanzen interviews, in which Mr. Utamaro materializes as the Asian compeer of the Hungarian historian, Dr. Bottwink, from Cyril Hare's stand-alone mystery An English Murder (1951). Mr. Utamaro is unable to prevent the small-sword from turning up protruding, predictably, from the body of one of his students, but he's able to solve the case and Keating gave his readers a surprisingly fair opportunity to do the same. Granted, it's not all that difficult to solve and I was put on the right track, early on, by what might have been unacknowledged joke in the story. There were also ideas planted here that took shape in succeeding novels. Here two German maids regularly interrupt the story to comment on the characters and events taking place in that sprawling mansion and they may have paved the way for Mrs. Cragg, a charwoman and occasional sleuth, from Death of a Fat God (1963) and a number of short stories. The seemingly impossible disappearance of the Japanese short-sword and how it came to disappear was revisited and improved upon with a vanishing one-rupee note in The Perfect Murder (1964). Zen There Was Murder stands as a fair-play detective story as well as allowing the readers of today to examine the ideas a young writer was working with and a writer who, evidently, never seems to have lost that youthful spark of enthusiasm for writing and mysteries. I have said in the past that Keating was as a mystery writer at his best when he wasn't trying to write mysteries. Keating was at his best when he hurled Ghote into a David vs. Goliath-style battle-of-wits, but he wasn't completely inept with the form and I'm glad to discover that The Body in the Billiard Room (1987) wasn't a one-off as a good example of classic, English drawing room mystery. By the way, I really love the title of this book. 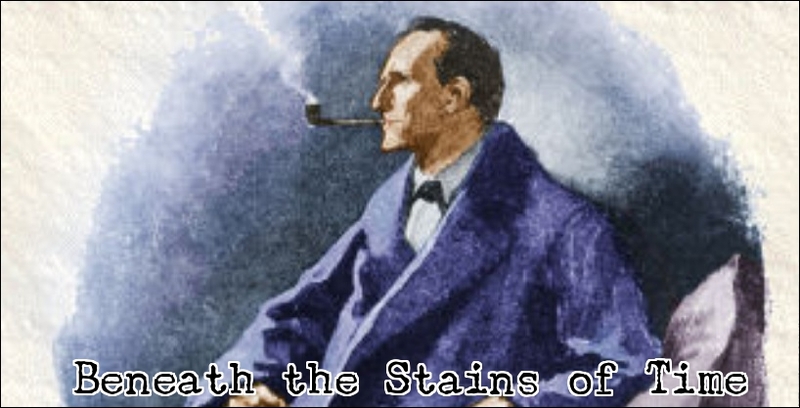 "Do you know, Watson... that it is one of the curses of a mind with a turn like mine that I must look at everything with reference to my own special subject. You look at these scattered houses, and you are impressed by their beauty. I look at them, and the only thought which comes to me is a feeling of their isolation and of the impunity with which crime may be committed there." The Voice of the Corpse (1948) launched Australian-born Max Murray's career as a mystery novelist and published twelve detectives altogether, uniformly titled, but lacking a series characters – accounting for his neglect in this day and age. A familiar name running through your books has proven itself to be one of the requisites to give your name some shimmer of immortality. 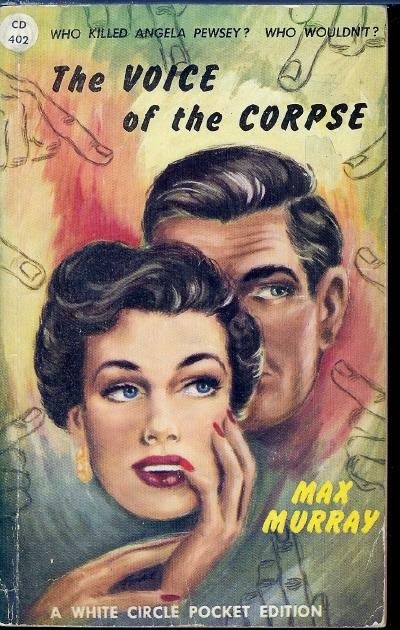 After having previously read The Neat Little Corpse (1951) and The Sunshine Corpse (1954), I had pegged Murray as a transitional fossil between the traditional whodunit and the modern-day crime novel – grouping him with Juanita Sheridan as a storyteller of crime in the guise of a detective story. Not a very apt description for The Voice of the Corpse, which stands as a very decent and well-done village mystery. Angela Mason Pewsey is a spinster in her late forties, who managed the fill the emotional void in her life by scattering the village of Inching Round with poison-pen letters and feeds off the fear they generate. However, it's not the taunting or threatening tone that's causing sleepless nights in Inching Round, but that their content is grounded in truth. Someone in the village has been digging around for dirt, and now, that same person has uncovered their secrets – and using it to torture them. Of course, casting furtive smiles at your victims or brazenly informing them face-to-face, is not an advisable course of action when you write poison-pen letters as a past time. So it's not a surprise when someone actually took a whack at her with the proverbial blunt instrument. Death came when Pewsey was seated behind her spinning wheel, converting a heap of chow dog hair into a pullover, while singing a folk song, which prevented her from hearing the intruder sneaking up from behind. Her black notebook is missing! Constable Wilks and Sergeant Porter are convinced that a passing tramp or gypsy killed Angela Pewsey and that's the angle they're focusing on. This (tiny) aspect of the plot is a bit class-conscience. Anyway, Mrs. Sim, a local lady, does not share the opinion of the police and asks her family attorney, Firth Prentice, to investigate and he becomes a reluctant amateur detective. There are two well-drawn small boys, Jackie Day and Alfie Spiers, who practically force their valuable assistance on Prentice – even presenting him with a scrap from Pewsey's elusive diary. They've also witnessed several events preceding the murder, but Prentice remains unproductive and sedentary. Not what Jackie and Alfie expected from a real-life detective. In Prentice's defense, nobody seems particularly interested in the identity of the murderer anyway. Prentice wonders at one point how many murders you have to commit in Inching Round before you become unpopular. The story is laced with these humorous observations and bantering comments, usually between Prentice and Celia, Mrs. Sim's daughter, which made a well-written story even more fun to read. Here’s as good as any place in the review to mention that I was strongly reminded of some of Gladys Mitchell's more conservative village mysteries, like The Mystery of a Butcher's Shop (1929) and Dead Men's Morris (1936), and the only elements that were missing was a pig farmer and a local legend. And maybe a drowning. Everything else was present. Even faint ties to folk song and dancing. Back to the review. The investigation enters its final stage when Inspector Tom Fowler from Scotland Yard arrives and he's able to pry loose more information and penetrate deeper, even if the villages themselves aren't aware that they helped the inspector. Fowler eventually makes his moves and secures a conviction, but the ending has an excellent twist packed away and was so much more than I expected from Murray. However, the solution works as a double-edged sword, because, morally, it's a highly ambiguous resolution. But, then again, whoever said that all village-themed mysteries were cozies? The Voice of the Corpse is one of many, many detective stories and novels weaving a pattern around villages and poison-pen letters, but I think Murray's first foray in the genre produced an above average example that stands out due to it unusual ending. The only feeling of disappointment I have now is realizing how much distance Murray had placed between himself and the traditional detective story after this debut novel. I would love to have read more mysteries from Murray written in this vein. On a final note, one of my favorite poison-pen stories is "The Possibility of Evil" by Shirley Jackson, collected in Murderous Schemes: An Anthology of Classic Detective stories (1996), in which poetic justice strikes down a writer of poison-pen letters. "Oh, my son! You don't know my history. I've seen a feller who was dead, and yet who wasn't dead. I've seen a man make two different sets of finger-prints with the same hands. I've seen a poisoner get atropine into a clean glass that nobody touched... as for a murderer floating in the air, I'm expectin' to meet one any day. It would just round out my cycle before the old man goes into the dustbin." There are only about half a dozen reviews posted on this blog concerning my all-time favorite mystery writer, John Dickson Carr a.k.a. "Carter Dickson," whose name, however, I drop whenever as much as a particle of an opportunity presents itself. You only have to look at the number of posts labeled "Locked Room Mysteries" or "Impossible Crimes" to know I had no shortage of opportunities. I felt that a return to the maestro himself was in order, and Sir Henry Merrivale in particular, but had only And So to Murder (1940) left to explore and I was in the mood for something grander – ending up re-reading one of the best titles in the H.M. series. She Died a Lady (1943) is set during the most defining period of the previous century, when Adolf Hitler had set out to conquer Europe and England was one of the last strongholds of the continent where his troops hadn't put boots on the ground... yet. The isolated, seaside town of Lyncombe with its sheer cliffs overlooking the sea, is almost a stand-in for the rest of the country. On top of that stone protrusion a small group of people begin to feel the effects of the war when it begins to intermingle with their normal, everyday problems. Dr. Luke Croxley's narration of the events begin with a visit from Rita Wainwright, a patient of his son, Tom, who caught herself up in an affair with an American actor named Barry Sullivan, while still being legally tied to her husband Alec – of whom she’s fond and wants to spare his feeling. But her desire to be with Barry grows with the day and Alec's only occupied nowadays with listening to gloomy news broadcasts on the wireless on the war. There, amidst the blackouts and rationing, someone cuts the phone lines and drains the petrol from the cars. Rita and Barry vanish. They only leave a trail of footprints behind on sandy ground of a cliff, "a romantic promontory called Lovers' Leap," which looks out over a seventy-foot drop into the unforgiving tides and rocks below. Everything points to a suicide pact, until they wash ashore and bullets peeled out of the body indicate that they were shot at close range before falling from the cliff. This does not preclude suicide, if the gun had been found at the top of the cliff or somewhere below, but it was discovered somewhere discarded on a road! This means, according to the evidence, that Rita and Barry were facing their murderer while standing on the edge of a cliff, which entails that the shooter was lighter than air, but still capable of lifting a gun, before apparently ceasing to exist. Or hovered back over the foot prints on to solid ground. Luckily, H.M. happens to be in the neighborhood to have his portrait done as a Roman senator and being bound to a (motorized!) wheelchair, on account of a broken toe, does not prevent him from leaving an ever-lasting impression on the village – frightening a few of its inhabitants by racing through the town as a cross between Winston Churchill and emperor Nero. However, the comedy does not intrude on the serious and somber tone of the story. It's Merrivale's way of coping with life and he becomes, IMO, more human as the story progresses. H.M. knows how to deal with supposedly cursed rooms that kill, dagger-waving poltergeists and the pseudo-science of telepathy, but a worldwide conflict the size of WWII reduces him to a rather helpless figure vowing "to be some use to this ruddy country yet... just you wait and see!" Before H.M. helped the allied forces plotting Hitler's downfall (you know he did), he did what he does best, find a natural explanation for everything. The impossibilities about footprints, whether it’s a single set of footprints where there were supposed to be two or the complete lack of them altogether, always struck me as one of the more difficult tricks to pull-off successfully – even more so if you try to be original. 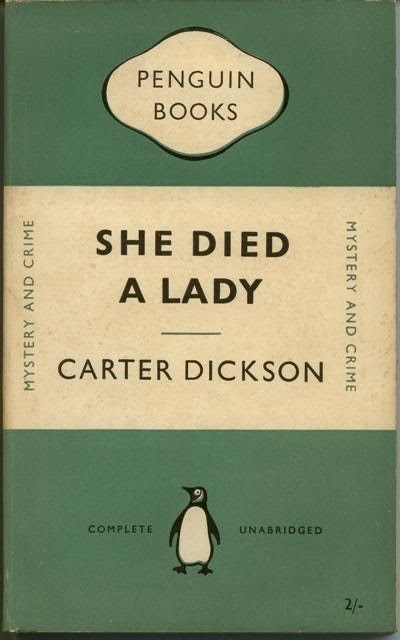 They always have me struggling for possible explanations and She Died a Lady is arguably Carr's most successful treatment of this type of impossible crime, because it's not a stock-in-trade situation the footprints emerge in and thus the solution is original. It's one of those tailor-made for the plot and setting types of solutions that Herbert Resnicow loved to play with during the 1980s (c.f. The Gold Deadline (1984) and The Dead Room, 1987), but the impossible elements do not dominate the story. They're a part of the larger picture that's not only one of Carr's most accomplished mystery novels, but also one of his most mature and character-driven stories, which deserves the reputation of The Judas Window (1938) – as good as that book is in it's own right, it lacks the depth of She Died a Lady. 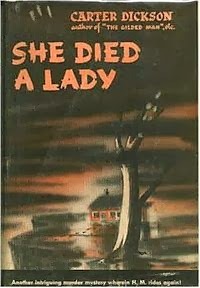 She Died a Lady is in my eyes Carr's Death on the Nile (1937), one of his favorite mystery novels, and if you look closely at the plot, you may agree with me that Lady might be a very cleverly disguised homage to Nile. If you can't see it, think of a water mirror effect with ripples in it, caused by Carr to give it his own touch. And that's not a spoiler, because (SPOILER, select of CTRL+A to read): it's not giving anything away when Carr’s Eternal Triangle has a fourth side. Vintage JDC! Finally, I found two more clock-quotes! I know, I know, but I'm still fascinated how the passing of time and the faces of clocks are associated in Carr's stories with impending doom, sickness or herald the death of a character. Sometimes, they even have the face of death, e.g. Death Watch (1935) and The Skeleton in the Clock (1948). "It inspired in me, I must confess, much the same sense of impending disaster as was inspired in Captain Hook by the approach of the crocodile with the clock inside." "A clock ticked asthmatically in the dark hall." I remain convinced that clocks are the source of all-evil in Carr's universe. "I just place a corpse somewhere to see what happens next. I look into my own fantasy at the people who get involved and I listen to them. And I write that down. It comes naturally." Before I dashed off, there was somewhat of a realization that I, perhaps, should've prepped one or two posts to keep this place from falling in abeyance for a fortnight, but hey, filler posts are exactly like posting nothing at all – except you actually put an effort into it. Unfortunately, for my return post, I did not had the time to excavate a classic from my shelves and, instead, knocked the remaining titles from the De Waal & Baantjer Bureau Raampoort series from my to-be-read pile before the latest from that line reaches its top. 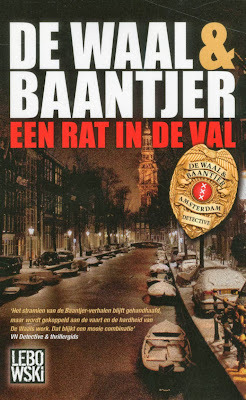 Een rat in de val (Caught Like a Rat in a Trap, 2011) is numbered fifth in the series that was continued at Baantjer's request, before passing away in 2010, in which the circumstances surrounding the remains of a murdered man gives the book a fitting title. The Singelgracht (Singel Canal) is the scene of dredging activities to clean the waters from discarded bikes and other junk, when one of the men drags up a car. It contents: a body that was remarkable well preserved due to the ice-cold water of the canal and the cause of death was strangulation. Whoever the victim was, he never stood a chance when the killer launched at him from the back seat. The veteran homicide detective in Monty-coat, Peter van Opperdoes, and his younger partner and friend, Jacob, haste to the scene of the crime to start their official investigation, but that proves to be a clash of generations. Van Opperdoes is mournfully looking on how forensic investigators, clad in white overalls, are trampling all over his crime scene. He's pining for the days when he had a scene to himself. When he could drink in the scene and find fragments of the atmosphere of the moment of the crime itself, which he actually gets when Jacob decides to chase everyone out of the inclosure – to give the old fox his moment and not without result. Van Opperdoes recognizes the victim as Albertus Koolschijn, alias "Bertje van de Dijk," a street rat and small-time criminal, who told Van Opperdoes, during their last talk, that his days of petty crimes were behind him. Even after the car had been dragged from the canal, Van Opperdoes and Jacob are still tossed around by the cross-and under currents that emerged from this case and De Waal introduces an interesting new idea involving stolen cars – even if it lacked finesse. De Waal and M.P.O. Books have apparently discussed how fair the solution of this story really is and I have to side with Books. You can make an educated guess in the right direction, but not, fully and completely, deduce it, because there are only few clues – or, as they're called today, indicators pointing to the truth. 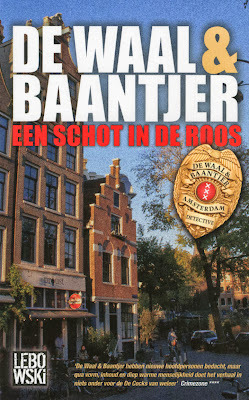 As usually, De Waal delivered a good and fun story about detectives, but not one that can also be considered a proper detective story. And that's pity. I really liked the ideas De Waal was throwing around here. Een schot in de roos (Hitting the Bulls-Eye, 2011) actually preceded Een rat in de val, released in the spring of that year, and have no idea why I switched them around for this review. Anyway, Bulls-Eye opens when city cleaner's hand in a phone they found in the trashcan and that's the moment when it goes off. Van Opperdoes picks up to hear the distressed voice of a mother worrying over her son, Michael Zand, missing for the past three days. Michael's father, Frits Zand, is an old acquaintance of Van Opperdoes, who made his name known on the shadier part of the law. The involvement or just the presence of professional criminal elements are a staple of De Waal's crime fiction and obviously has a lot of fun toying around with their entrepreneurial spirit (albeit an alternative one) and rivalries – and their involvement is tightly woven into the plot of this story. Before they've even begun investigating the disappearance of Michael Zand, they receive a call to go to an abandoned factory where gunfire left casings and a body in the basement. It's a gathering place for junkies and other city misfits, but the most interesting discovery is a piece of paper in the victim's pocket with Michael's phone number scrawled on it! The two investigations have come together, but it's pretty much the same story as before. 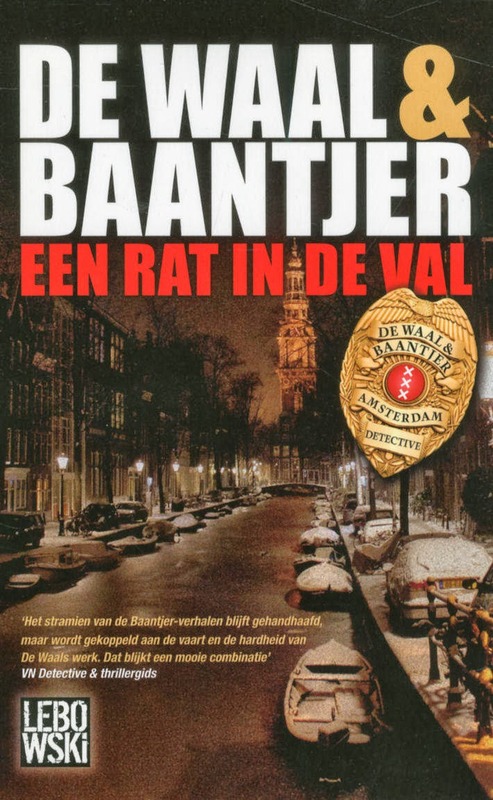 De Waal tells an engrossing story that captures both the spirit and tone of Baantjer, whenever Van Opperdoes and Jacob interact with each other, but I can be really picky when it comes to plotting and clueing – although I liked this solution a little bit better than the one offered in Rat. So great reads, if you don't expect them to deliver a traditional whodunit. I really do hope that, plot-wise, the series will look back at Een licht in de duisternis (A Light in the Darkness, 2012), which none of the other entries can hold a candle to in that department. It has the story telling and a good plot to boot!